Date of birth unknown. His first stage name was Sendai Bunroku. He became a disciple of Saigoku Hyôgorô I and received the name of Saigoku Hyôsuke in 1694. He appeared on stage for the last time in the 1st lunar month of 1723, in Edo at the Moritaza, where he played the role of Oniô Shinzaemon in the new year sogamono drama "Suiryô Soga". 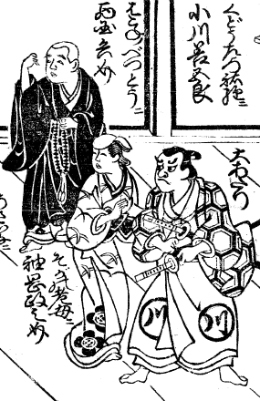 His rank in the 1723 Edo hyôbanki , dôkegata section, was jô-jô (superior - superior) [visual]. He died in Edo the 10th day of the 6th lunar month of 1725 . His ranking was the same in the two 1723 Edo hyôbanki, the one published the 1st lunar month and the one published in the 3rd lunar month. The 10th day of the 6th lunar month of the 10th year of the Kyôhô era was the 19th of July 1725 in the western calendar.